As Faithwire has reported, Philadelphia Eagles quarterback Carson Wentz wears his faith on his sleeve. 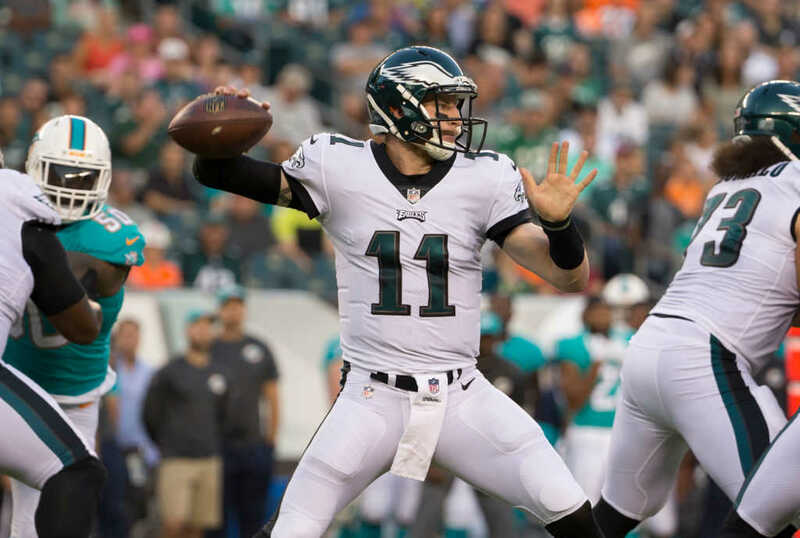 The second-year footballer is not shy in sharing his love of God and his Christian beliefs on social media, and, at an event last week, Wentz opened up about how his understanding of faith has evolved over the years and why his relationship with Jesus is his number one priority. On Wednesday, Wentz and fellow Eagles Trey Burton and Stefen Wisniewski attended a special live broadcast of Philadelphia’s “Faith on the Field” radio show at Eastern University in Pennsylvania. Despite the rainy weather and outdoor venue, the Christian Post reported that some 2,000 people attended the free event. Wentz, a born-and-raised Lutheran who now considers himself a nondenominational Christian, shared that, growing up, he found himself falling prey to traditional public opinions regarding the tenants of Christianity. The quarterback explained that he believes there is a particular “lie” about the Christian faith and salvation that the devil wants people to believe. In Wentz’s opinion, too many people view heaven as something to earn your way into through actions and deeds, and, as a result, they put their relationship with God and Jesus on the back burner. Wentz believes such a prioritization is faulty and called it a “misconception that a lot of people have,” though he admitted that he too had that understanding of Christianity, until he came across a Bible verse that changed is perspective. While Christians are certainly called to do good by and for one another, Wentz warned against believing that human beings will be saved through works alone. Wentz has been unapologetically vocal about his faith both on social media and in interviews. He recently told CSN Philly that he while he is not trying to “[beat] people over the head with the Bible,” he “loves Jesus” and, therefore, will not shy away from talking about him. You can't earn grace. It's free. It's the greatest gift there's ever been & will be. Accept it. Through his A01 foundation, the 24-year-old rising NFL star hopes create an environment where he can more easily assist those in need, while deepening his own relationship with God.